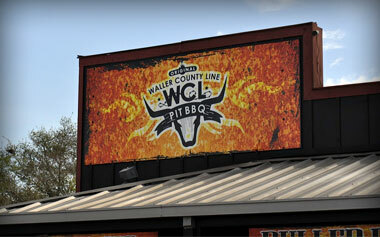 Make Waller County Line BBQ (WCL) your one-pit-stop, just off the freeway at 290 and exit FM 362. 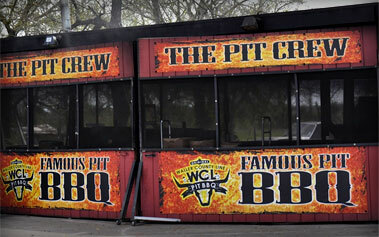 Established in 1995, WCL has become not only a local Waller favorite, but also one of 290's most famous "pit-stops" for travelling families, bikers, and commuters to Austin and College Station. WCL is home to the most delicious, authentic slow cooked pit BBQ. It all started with one simple goal in mind, "to serve the best pit BBQ in the state of Texas". We take pride in offering a family-friendly experience. When you enter the store, you will be greeted by welcoming smiles from staff members boasting years of experience. Locals mosey taking pleasure in each other's company, and also enjoy our slow-smoked pit BBQ with the "secret recipe sauce" that completes every savory bite. At Waller County Line, patience is the secret when preparing the melt-in-your-mouth beef brisket, ribs, chicken, and sausage on real pit smokers, where it is slow-cooked until it reaches the perfect juicy, tender perfection. Our sausage is prepared throughout the day to assure you are getting only the freshest quality in every bite. WCL is also the home of the overstuffed baked potato, loaded with our BBQ chopped beef, fresh butter, sour cream, cheese and crumbled bacon. It is then smothered in our mouth-watering sauce. This spud will definitely satisfy any large appetite. All entrees are served with choices of country-style potato salad, coleslaw, or baked beans. After loading your plate with mouth-watering WCL BBQ, you can choose from many of the prepared-from-scratch baked goods and desserts. All pies, cakes, cookies, banana pudding, cobblers, sweet potato pies, and our to-die-for oversized chocolate brownies are made on-site in the WCL country bakery. We also carry a full collection of all-natural jerky in elk, venison, beef, and turkey. Additionally, we feature jams, jellies, authentic Cajun Boudin, and turkey legs made specifically for our store. At Waller County Line, you'll not only find the finest BBQ, you will also discover a store filled with all of your needs, including fuel, camping supplies, hardware, groceries, refreshments and clean bathrooms. We are truly your "one-pit-stop" store. When you're done with dinner, walk over to the famous Cedar Creek Saloon for live music, pool, shuffleboard, and the coldest beer in Waller County. 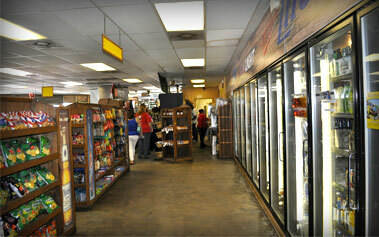 Once you stop in at Waller County Line, you will become a "regular" whether you are in need of gas or refreshments. Waller County Line will tempt your taste buds with the lingering smell of our amazing pit BBQ, where our store never closes and our pits are constantly smoking. No gas or electricity, just serious pit BBQ! Don't forget to take us home for dinner or let us cater your next event.